Josean Fernandez is well acquainted with pressure. As a managing director at New York City-based OppenheimerFunds—a leading global asset management firm—he oversees partnerships with global private banks whose accounts invest billions of dollars in assets with the firm. But his talent for communicating his vision and his leadership are what set him apart in a field not known for an overabundance of Latino influence. At OppenheimerFunds, he’s tasked himself with finding more ways to make Latino voices heard in addition to providing a mentoring hand for those who see the value in what Fernandez calls a growth mind-set. 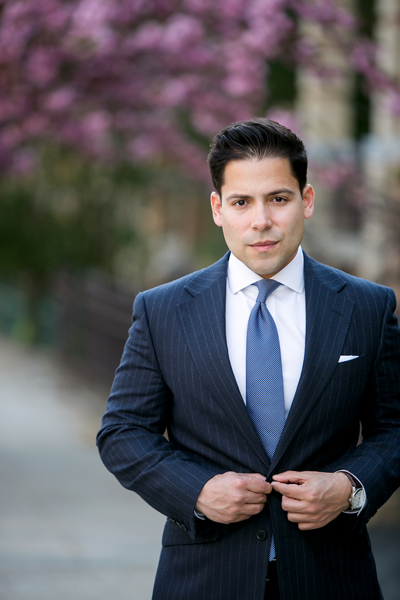 Here, he shares how his background prepared him for this role, how he has lacked professional mentors, and how he’d like to change Latino representation in leadership within the finance industry. Your upbringing bridged the gap between two different cultures. What did you draw from your experience dividing your time between Puerto Rico and the United States? I was born in Puerto Rico, but I left at a young age and attended school in the United States. I spent my summers in Puerto Rico. In the movie Selena, the dad was quoted saying, “We need to know about Christina and Oprah.” I jumped between Caso Cerrado and Judge Judy. I needed to acclimate to two different cultures. Looking back, it was an incredible lesson on cultural awareness. Being able to adapt to people, their needs, and their backgrounds—it’s a massive benefit, especially as the world has become more global. You place a high premium on informal mentoring. What does mentoring mean to you, and did you have a strong mentor as you were entering the business world? I realize this may sound a bit sad, but I’ve never felt like I have had a mentor. There aren’t many high-powered Latinos in finance, unfortunately. Whenever I get a list of CEOs or executives, I immediately scroll down to see if there are any Latino last names: Rivera, Ramirez, Gonzalez, etc. As a mentor, I’ve always taken the mind-set that you should be a guide, not a judge. I try to remind mentees that you can’t make serious change when all the intangibles are given to you. Decision-making requires you to make decisions with limited information. This is where you have the biggest impact. I work to encourage others to think creatively first and critically later. You’ll have enough criticizers down the line. Finally, one of the most important things I try to keep in mind and pass along is to never stop trying to be qualified for the job. That keeps you more mentally flexible and less likely to lock in on a fixed way of doing things. You helped create the Latino Professionals Network at OppenheimerFunds. What prompted this undertaking? I am currently the president of the Latino Professionals Network (LPN), one of the firm’s Business Resource Groups (BRGs). As part of its diversity and inclusion efforts, OppenheimerFunds provides employees with the opportunity to connect with the diverse experiences of their colleagues by joining BRGs, which also include the Asian Professionals Network, Black Professionals Network, Disabilities Network, LGBTQ+ Network, Military Network, and Women’s Network. The LPN, in particular, is dedicated to helping OppenheimerFunds to celebrate the diversity of Latino culture and to leverage our perspectives to advance our community and our business goals. We need more senior Latinos in finance. I think we are making progress in entry-level and middle-management positions, but Latinos are just not as present as I’d like in higher positions. When we started the LPN, it was initially three individuals, including me. That’s reason enough to continue with it. The lack of Latinos is what motivated me. Today, we’re around forty-five individuals, and that’s only a year and a half in. The idea is to create an appetite for experimentation and a team ready to try new things. It’s a safe environment to take initiative and take risks. What does a growth mind-set mean to you? How do you encourage it? In a fixed mind-set, you believe your abilities, intelligence, and talents are just fixed traits. You have a certain amount, and that’s that. In a growth mind-set, you understand your talents and abilities can be developed through effort and time. You don’t necessarily think everyone’s the same or anyone can be Einstein, but you believe everyone can get smarter if you work at it. You encourage this by admiring effort. Don’t let go of something until you understand it. I am that annoying guy that will stop the meeting and say, “I don’t understand this.” If someone is willing to take a risk and they fail but they’ve learned a great deal, I admire that. That’s having a growth mind-set. What advice do you have for Latinos who hope to find themselves in a role like yours? Talk about the value you provide to the organization. It’s not just about the nine-to-five or what falls under your list of responsibilities. Obviously, you have to do that well, but at most good organizations, most people do their nine-to-five well. What many don’t do is go the extra mile. Take on additional projects, or take it upon yourself to fix inefficiencies. I’ve always been proactive and comfortable with stepping outside of my day-to-day. Latinos are often naturally engaging and relationship driven. Unfortunately, we suppress that at times because we think we might be viewed as boisterous. We should be leaning into that. In a world where emotional intelligence is at an all-time low and effective communicators are seemingly harder to find, Latinos should channel their natural communication style. It is in demand.